The May 30, 2008 issue of the Jakarta Post (Indonesia) contained a Supplement Section on healthcare in Singapore. Specialist Dental Group was featured in two stories. 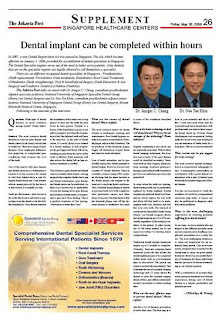 In the first story, Drs Ansgar Cheng and Neo Tee Khin were interviewed on dental issues in Asia and in the second story, Moonlake Lee was interviewed on popular dental tourism procedures in Singapore at Specialist Dental Group.